Absolutely Immaculate Cape Cod in Ladue! Home has completely been updated! NEW: modified- 4 bed - 5 baths Extremely OPEN floor plan. Amazing layout for entertaining with bedroom and full bath on Main Floor. Gorgeous New kitchen, custom maple cabinets, granite, stainless steel appliances, pantry, and huge breakfast bar. Some of the features - upated windows, exterior doors, 2 panel interior doors ,concrete driveway, walk/way, large patio, HVAC,50 gallon hot water heater, hard wired smoke detectors, fireplace stone front, gas logs, new stair case(with iron SPINDLES, lighting and fixtures, HARDWOOD floors, and so much more to appreciate!. Fresh paint, CAN LIGHTS everywhere, Security Cameras, Lower level finished with huge recreation room, extra sleeping area w/FULL bath. Storage in lower level too! 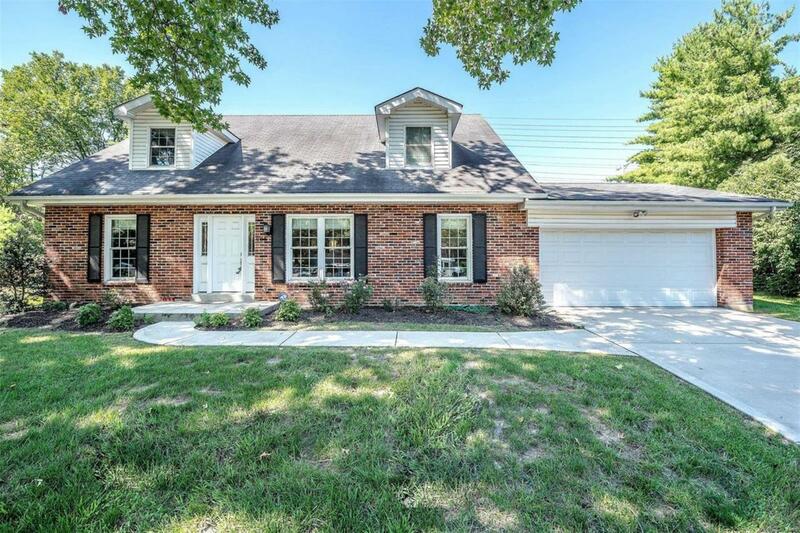 Walk to Ladue Schools and close to private schools, shopping. HURRY to come see this!!! ASK ME ABOUT THE CARPET BEING REPLACED THIS WEEK. HOME IS MOVE IN CONDITION!! !